Subject to the following Organic Themes Terms and Conditions (the “Terms”), Invulu, Inc (“Organic Themes”) provides this website, services, products and content (collectively, the “Site”) to you. Your access or use of the Site constitutes your agreement to all such terms, conditions, policies, rules, procedures and notices (collectively, the “Agreement”). If you do not agree, you may not access or use the Site. These Terms, and the Site, may be updated from time to time without notice to you. Organic Themes charges an annual support and website licensing subscription fee at the same rate as the purchased product for each product. The subscription is for ongoing theme support, updates, maintenance and account access. The subscription renews once per year from the date of purchase at the same rate as the purchased theme or package. The subscription may be canceled at any time within your Organic Themes Account or through PayPal. Canceling a subscription will result in suspended access to your Organic Themes account and suspended access to support resources after one year from your initial purchase date or the last successful subscription renewal. Organic Themes is not responsible for the failure to cancel a subscription in the event that it is no longer desired. Canceling a support subscription is the responsibility of the customer. With the exception of the Developer Membership, each product is limited to one single website license. Licensed websites will receive automatic theme updates. Organic Themes retains the right to change the terms and conditions and licensing of this site and our themes at any time without notice. Organic Themes reserves the right at any time and from time to time to modify or discontinue, temporarily or permanently, the Service (or any part thereof) with or without notice. You agree that Organic Themes shall not be liable to you or to any third party for any modification, suspension or discontinuance of the Service. Organic Themes may change, add or remove any part of this Agreement, or any other terms associated with the use of the site, at any time. Any changes shall become part of the Agreement and shall apply as soon as such a notice is posted. By continuing to use Organic Themes properties after the notice is posted, you are indicating your acceptance of those changes. Support is provided for any theme purchased from Organic Themes for a year after the purchase date, or for as long as the annual support subscription is renewed. Support includes the rectifying of issues arising from packaged theme features, bug fixes and basic usage questions. We do not provide support for our free themes; the use or issues arising from the use of 3rd party plugins; troubleshooting issues occurring in versions of Internet Explorer older than version 11; WordPress itself; or customization. Questions and inquiries should be directed to our support forum. Note: Support is offered Monday through Friday, 9AM to 6PM EST (UTC/GMT-5). Support requests are answered in order received, with priority support member questions being answered first. The Theme Setup Service is generally completed within 72 hours from receiving the necessary customer information requested via contact form upon the purchase of the service. The service includes the basic installation of WordPress and/or an Organic Theme, and it includes the setup of the WordPress theme as per the theme demo. In addition, we may upload and configure a single logo and background image for the site. 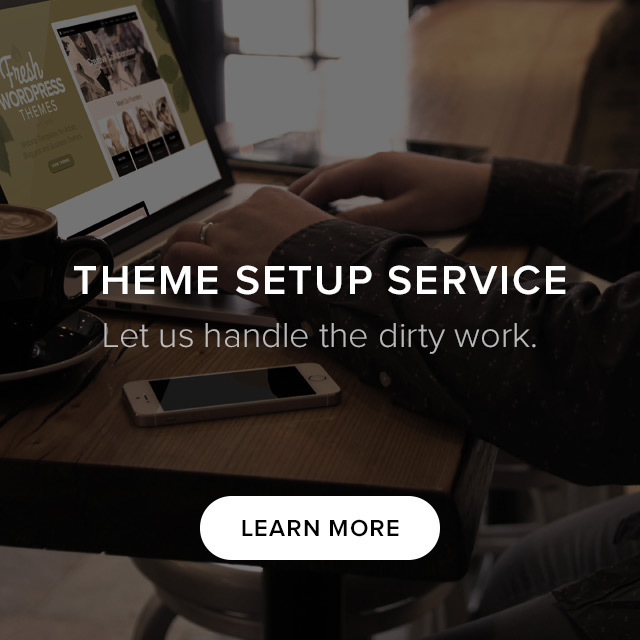 If a Theme Setup Service is paid for and submitted with requests beyond the scope of the service as defined on the Organic Themes site, we will kindly ask that the request be modified to meet the requirements previously outlined. In the event the request cannot be modified to meet the theme setup requirements, we will provide a refund and the setup service will not be completed. We do not offer refunds for digital product sales or subscription renewal fees. All sales are final. If there is an issue regarding a theme, we will address the problem. Unfortunately, there is no effective way for us to both combat fraud and issue refunds. We will be happy to answer questions regarding our themes before your purchase to ensure it will meet your needs. Thank you for your understanding. The CSS, XHTML, PHP, design and any other elements of the themes downloaded from Organic Themes are released under the GPL license. They and are in total compliance to standards of that license as well as with WordPress. The themes available for sale on our site are not compatible with the wordpress.com blogging community. They are developed for individual installations of the WordPress platform. The content (copy, images, video, etc.) within our site and theme demos is royalty free and/or has been purchased by and licensed to Organic Themes. Such content is subject to its respective original license and permitted for use only by Organic Themes. In accordance with those licenses, Organic Themes can not and do not authorize the use of any licensed content by any customers or on any other sites not owned by Organic Themes. Currently our themes are designed to function properly with WordPress 4.0 and higher. It is our job to make sure the themes are up to date with the latest versions of WordPress. We cannot guarantee they will work properly on older installations of WordPress. We cannot guarantee the compatibility of our themes with all third party software and plugins. If a conflict does arise, we will do our best resolve the situation. Moreover, we cannot guarantee the themes will function correctly after modification to the code, or a failure to install the theme or WordPress properly. Affiliates will be paid each month for valid referrals generated from 2 months prior. You must have a verified PayPal account and accumulate at least 3 theme sales to receive affiliate payment from Organic Themes. Also, you must submit your W-9 or W-8BEN tax form, as well as your PayPal email address to [email protected] in order to receive payment. Misrepresenting or inaccurately describing Organic Themes services, products, brand, or trademark. YOU EXPRESSLY UNDERSTAND AND AGREE THAT WITH REGARD TO THE CONTENT, PRODUCTS AND SERVICES AVAILABLE THROUGH THIS SITE, IN NO EVENT SHALL ORGANIC THEMES OR ITS OWNERS, OFFICERS, DIRECTORS, EMPLOYEES, AGENTS, SUCCESSORS, SUBSIDIARIES, AFFILIATES, DISTRIBUTORS OR THIRD PARTIES PROVIDING INFORMATION ON THIS SITE BE LIABLE FOR ANY DIRECT, INDIRECT, INCIDENTAL, SPECIAL, CONSEQUENTIAL OR EXEMPLARY DAMAGES, INCLUDING BUT NOT LIMITED TO, DAMAGES FOR LOSS OF PROFITS, GOODWILL, USE, DATA OR OTHER INTANGIBLE LOSSES (EVEN IF ORGANIC THEMES HAS BEEN ADVISED OF THE POSSIBILITY OF SUCH DAMAGES). THIS PARAGRAPH SHALL ALSO APPLY TO (i) THE USE OR THE INABILITY TO USE THE SERVICE; (ii) THE COST OF PROCUREMENT OF SUBSTITUTE GOODS AND SERVICES RESULTING FROM ANY GOODS, DATA, INFORMATION, PRODUCTS OR SERVICES PURCHASED OR OBTAINED OR MESSAGES RECEIVED OR TRANSACTIONS ENTERED INTO THROUGH OR FROM THE SERVICE; (iii) UNAUTHORIZED ACCESS TO OR ALTERATION OF YOUR TRANSMISSIONS OR DATA; (iv) STATEMENTS OR CONDUCT OF ANY THIRD PARTY ON THE SERVICE; OR (v) ANY OTHER MATTER RELATING TO THE SERVICE. a. YOUR USE OF THE SERVICE IS AT YOUR SOLE RISK. THE SERVICE IS PROVIDED ON AN “AS IS” AND “AS AVAILABLE” BASIS. ORGANIC THEMES EXPRESSLY DISCLAIMS ALL WARRANTIES OF ANY KIND, WHETHER EXPRESS OR IMPLIED, INCLUDING, BUT NOT LIMITED TO THE IMPLIED WARRANTIES OF MERCHANTABILITY, FITNESS FOR A PARTICULAR PURPOSE AND NON-INFRINGEMENT. b. ORGANIC THEMES MAKES NO WARRANTY THAT (i) THE SERVICE WILL MEET YOUR REQUIREMENTS, (ii) THE SERVICE WILL BE UNINTERRUPTED, TIMELY, SECURE, OR ERROR-FREE, (iii) THE RESULTS THAT MAY BE OBTAINED FROM THE USE OF THE SERVICE WILL BE ACCURATE OR RELIABLE, (iv) THE QUALITY OF ANY PRODUCTS, SERVICES, INFORMATION, OR OTHER MATERIAL PURCHASED OR OBTAINED BY YOU THROUGH THE SERVICE WILL MEET YOUR EXPECTATIONS, (v) ANY ERRORS IN THE SOFTWARE WILL BE CORRECTED, (vi) OR THAT THIS WEB SITE, ITS CONTENT, PRODUCTS AND THE SERVERS ON WHICH THE WEB SITE, PRODUCTS AND CONTENT ARE AVAILABLE ARE FREE OF VIRUSES OR OTHER HARMFUL COMPONENTS. d. NO ADVICE OR INFORMATION, WHETHER ORAL OR WRITTEN, OBTAINED BY YOU FROM ORGANIC THEMES OR THROUGH OR FROM THE SERVICE SHALL CREATE ANY WARRANTY NOT EXPRESSLY STATED IN THE TERMS. e. THIS WEB SITE MAY CONTAIN VARIOUS COMBINATIONS OF TEXT, IMAGES, AUDIOVISUAL PRODUCTIONS, OPINIONS, STATEMENTS, FACTS, ARTICLES, OR OTHER INFORMATION CREATED BY ORGANIC THEMES OR BY THIRD-PARTIES. DUE TO THE NUMBER OF SOURCES FROM WHICH CONTENT IN THIS SITE IS OBTAINED, AND THE INHERENT HAZARDS OF ELECTRONIC DISTRIBUTION, THERE MAY BE DELAYS, OMISSIONS OR INACCURACIES IN SUCH CONTENT. ACCORDINGLY, SUCH CONTENT IS FOR YOUR REFERENCE ONLY AND SHOULD NOT BE RELIED UPON BY YOU FOR ANY PURPOSE. f. INFORMATION, PRODUCTS AND/OR CREATED BY THIRD PARTIES THAT YOU MAY ACCESS ON THE SITE OR THROUGH LINKS IS NOT ADOPTED OR ENDORSED BY ORGANIC THEMES AND REMAINS THE RESPONSIBILITY OF SUCH THIRD PARTIES. All materials on this site (”Online Materials”), including, without limitation, names, logos, trademarks, service marks, images, articles, columns, graphics, photographs, illustrations, artwork, blog posts, audio clips, themes, video clips, software, and other elements making up the Service are protected by copyrights, trademarks and other intellectual property rights owned and controlled by Organic Themes or by other 3rd parties. Except as specifically provided herein, no Online Materials may be copied, reproduced, republished, downloaded, posted, transmitted, distributed, or resold in any way, or otherwise used for any purpose, without the prior written permission of Organic Themes or the respective owners. Unless otherwise specifically allowed by these Terms, you may not add, delete, distort, or otherwise modify the content or the products provided by this site. Any unauthorized attempt to modify any Online Material, to defeat security features, or to utilize this site for other than its intended purposes is strictly prohibited. Organic Themes and its respective logos, product names and service names are trademarks of Organic Themes. All other trademarks appearing on the Site are trademarks of their respective owners and our reference to them does not imply or indicate any approval or endorsement by their owners unless such approval or endorsement is expressly made. a. NON-WAIVER: The failure of Organic Themes to exercise or enforce any right or provision of the Terms shall not constitute a waiver of such right or provision. If any provision of the Terms is found by a court of competent jurisdiction to be invalid, the parties nevertheless agree that the court should endeavor to give effect to the parties’ intentions as reflected in the provision, and the other provisions of the Terms remain in full force and effect. You agree that regardless of any statute or law to the contrary, any claim or cause of action arising out of or related to use of the Service or the Terms must be filed within one (1) year after such claim or cause of action arose or be forever barred. b. INDEMNIFICATION: You agree to indemnify, defend and hold Organic Themes harmless from any claims and expenses, including reasonable attorneys’ fees, arising from or related to any breach by you of any terms of this Agreement. c. PRIVACY: You can read Organic Themes privacy statement here. d. RESTRICTIONS ON USE: You may not use Organic Themes site, content, products or services for any illegal purpose or in any manner inconsistent with these Terms. You agree to use your Organic Themes membership solely for your own use and purposes and not for resale or other transfer or disposition to any other person or entity. f. CHOICE OF LAW AND FORUM: This Agreement will be governed by the laws of the State of Hawaii. Any dispute arising from the terms of this agreement or breach of this agreement will be governed by the laws of the State of Oklahoma and you agree to personal jurisdiction by the state and federal courts sitting in Kahului, Hawaii. The parties hereby expressly waive trial by jury in any action, proceeding or counterclaim brought by either of the parties against the other on any matters whatsoever arising out of or in any way connected with these Terms and agree to submit to binding arbitration. g. REFUSAL OR DISCONTINUANCE OF SERVICE: Organic Themes reserves the right to refuse, terminate, or restrict service to any user for any reason or no reason at all. i. ENTIRE AGREEMENT: This Agreement and any other terms and conditions of service on any Organic Themes property constitute the entire agreement between you and Organic Themes and govern your use of the Service.